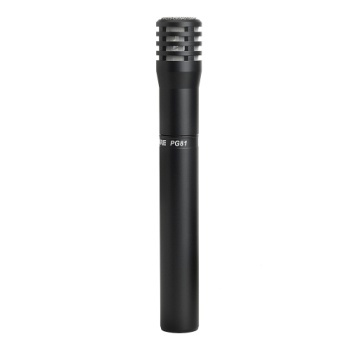 A sensitive, flat response condenser microphone ideal for acoustic instruments. Flat frequency response is wide and uniform. Consistent sensitivity through frequency range. Cardioid polar pattern picks up the most sound from in front of the microphone and some sound from the sides. Less susceptible to feedback in high volume settings. Condenser cartridge has a lightweight, sensitive diaphragm. Precisely and smoothly captures sound nuances. Powered by AA battery or phantom power supply. Internal shock mount for reduced handling noise. Durable metal construction. On/off switch for onstage control. Includes XLR cable.